The University is one of 54 to benefit from a total pot of £10 million funding, via Sport England’s University Sport Activation Fund, to help encourage nearly 180,000 new students to be active. In partnership with the University of Plymouth Students’ Union (UPSU), the University will be able to extend its sporting activities based upon the feedback from consultation with more than 2,000 students on what would encourage them to play more sport. The new project will provide a package of increased sporting opportunities focussed upon three key groups – first year students, female students, and students with disabilities. Professor Richard Stephenson, Pro Vice-Chancellor for Student Experience said: “The health and wellbeing agenda is incredibly important to the University, and this funding will enable us to take forward this exciting new project in partnership with our students and the UPSU. Statistics show that just over one half of higher education students take part in sport at least once a week. The funding will support projects to not only maintain this level of participation but also increase it by trialling new methods of getting students into sport and offering a wider variety of opportunities to keep them playing during their time at university. The projects will particularly concentrate on those that do not currently play, and will also help tackle the issue of many young people giving up sport in their late teens and early twenties. 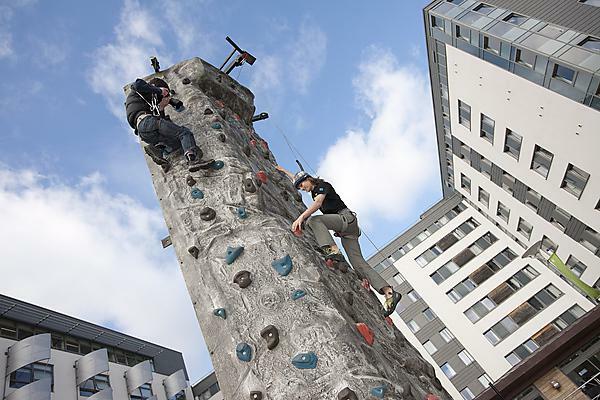 One of the defining features of the Plymouth bid is the focus upon non-traditional venues for sport, including in halls of residence, with inter-hall competitions, and in outdoor locations in the local area. There will be an emphasis upon small group sessions, particularly for disabled students, complete with a Health and Wellbeing referral scheme and GP engagement. There will also be partnerships with local community groups in sports such as volleyball, handball, netball, cricket, rounders and basketball. The latest funding for university sport builds on Sport England’s highly successful three year ‘Active Universities’ programme which delivering a two per cent rise in the number of students playing sport regularly at the 41 university projects we invested in.